The first car Alex ever drove was a 1973 Volkswagen Bus. His friend handed him the keys and said, “Just drive it.” The feeling of joy as the Bus slid in to first gear and started to roll never left him. It took a while before Alex finally found a Volkswagen Bus of his own. When Alex finally purchased his 1971 Bus he was in love. Alex put his heart into restoring the 1971 Bus but was dreaming of a 1964 model. Wishes do come true as Alex recently acquired his much loved 1964 Bus and found the 1971 model a new home. Alex’s 1964 Bus “Galeila” won 1st place at the 2017 Pata De Perro VW Car Show for its class. Alex is a Napa native and the father of 4 boys. His 2nd oldest son drives a 1971 Super Beetle. Alex lives with his sons, their 2 dogs (Charlie & Homer), and their cat (Hubba). Don has always said, “Once it get’s in your blood, it’s always there.” He is living proof of this. He got his first Volkswagen when he was 14 years old and has never looked back. 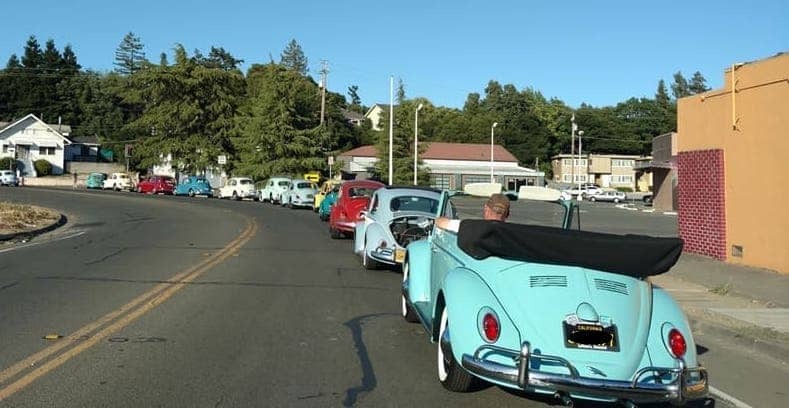 Don has restored HUNDREDS Volkswagens since getting that first car. In fact, his old 65 convertible was featured in the short film “The Situation”. Although not his official “profession”, Don has helped countless people keep their Volkswagens alive and running. Don is a Napa native and has been married to his wife Kathleen for over 20 years. They live with their son and Boris the cat. Nikki fell in love with Volkswagens when she was in high school. Nikki remembers a male schoolmate that drove a Karmann Ghia to school every day and from then on, she only had eyes for Volkswagens. She bought her first Volkswagen, a 1969 Bug when she was just 19 years old. She has since been the proud owner of a 1964 Bug and a much desired 1967 Karmann Ghia. Nikki and her mother repaired the interior of the Karmann Ghia themselves. She put a lot of heart and love into that Ghia and was sad to eventually have to let her go. Nikki currently owns a 1971 Bug, a 1971 Westy and a 1966 Karmann Ghia. Not only does Nikki own a fleet of Volkswagens, but her family also have their own models as well. Nikki’s son previously owned a 1972 Squareback and a 1971 Fastback. Her mother and father currently own a 1971 Bus. Nikki can’t wait to help her daughter pick out her first Volkswagen. Kerri has loved Volkswagens since she first saw a Thing when she was six years old. She got her first Volkswagen, a 1969 Squareback in 2008. In 2013 Kerri relocated to Northern California to be with the love of her life, Steve. Kerri and Steve both being Volkswagen enthusiasts combined their Volkswagen collection which now includes the Squareback, a 1972 Bus, a 2013 GT,I and a 2013 CC. Kerri owns a bookkeeping company and is a volunteer living history docent at Hearst Castle. Her hobbies include playing pool and collecting historical memorabilia. Kerri currently resides in Vacaville and enjoys spending time with Steve, their dog Peetie and Ghia and three California Desert Tortoises.